Beautiful girl having thai massage. Beautiful white girl having thai massage. Beautiful woman having relaxing in spa massage salon. Young woman having foot massage. Couple having stone massage. Ayurveda lastone spa treatment. Young family having stone massage. 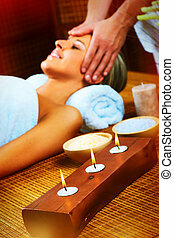 Ayurveda lastone spa massage treatment. Young woman having Ayurveda stone massage. Couple lays her head to window having stone massage. Ayurveda lastone spa treatment. Woman having India massage with herbal ball.